Now logic says that Sorcerers are supposed to be better at magic than Arcane Detectives and Mystics...but they should also be at least as good as Flesh Sculpters. I will rule that Human Sorcerers should start with 2d4*10+PE in PPE and gain 2d6 PPE per level. Mystics and Arcane detectives and Mirror Mages will get 1d6*10+PE at starting level and continue to increase in PPE as previously dictated. Other classes should not be affected. The Nightbane skill list is not comprehensive, it simply covers the more common skills in the setting. If a character has a good reason to have a skill not listed in the section on Nightbane skills, I will generally allow taking it with the following stipulations. 1) A rare skill can not be taken as a secondary skill. It takes enough time and dedication to learn a skill not on the lists that it has to be taken as an OCC or Related skill. 2) Learning the skill has to be explained in the character background. House Rule #3: Physical Conditioning and Supernatural Attributes. So far my rule has been that you can not train using human methods if you possess Supernatural Attributes. It appears that this rule is actually an HU rule, not a general Palladium rule, but I have to think of the biology of the question. 1) If you possess regeneration, normal human means of training Physical Strength will not work. This is because such means depend on repeatedly stressing tissues. If you regenerate your body deals with such stress too quickly. This also goes for skills like Wrestling, Boxing, Acrobatics, and Gymnastics increasing Physical Endurance (but not Running...but see below). Unfortunately it also goes for skills that increase SDC. 2) If you possess immunity from fatigue, you can not use some means of training Physical Endurance. Things like Long Distance Running simple do not work to build endurance if you do not tire. However, skills like Wrestling, Boxing, Acrobatics, or Gymnastics may work (but see rule #1). 3) Training that increases Physical Prowess DOES work, that is more a matter of the mind and the reflexes. This also goes for gaining extra numbers of attacks from skills like boxing. 4) If you have Supernatural Strength, but not Supernatural Endurance or Regeneration, you can train by normal means, you simply need larger weights to train with and to train longer to get results. 5) If you do not constantly have Supernatural Attributes and Regeneration (which is the case for most Nightbane), then you can train while your abilities are at normal human level and get normal effect, and then keep the advantages when you return to your enhanced abilities. To prevent confusion, we will be using the RUE versions of combat skills, rather than those in Nightbane (I noticed some of you were using one and some the other). Level 1: Starts with one hand to hand attack per melee round. This reflects the character's pitiful fighting skills. HOWEVER, the character gets TWO non-combat melee actions at first level. A non-combat action involves some activity other than fighting (operating a machine, driving, locking a door, running, hiding, helping others. etc.). Level 3: +1 attack per melee round and +1 to dodge. +1 non-combat melee action. Level 6: +2 non-combat melee actions. Level 9: +1 attack per melee round, for a total of three "attacks" per round (each attack counts as two melee actions for this character). +1 non-combat melee action for a total of six melee "actions." That's it. This is an elementary form of hand to hand combat training. Though it hardly stacks up against some of the more advanced forms of fighting, one who has trained in Hand to Hand: Basic still fights with combat skill compared to the simple. everyday folk without training. Note: Basic combat training enables the character to use any basic/common attacks, including Punch, Elbow, Kick. Knee, Disarm. Dodge, Entangle, Body Block/Tackle, Body Flip/Throw. Roll with Impact. Power Punch (but not a Power Kick) and Pull Punch - but no special moves or martial art attacks such as Automatic Dodge. Back Flip, Holds, Karate Punches. Leap Kick or other moves. Level 1: Starts with four attacks/actions per melee round: +2 to pull punch and +2 to roll with punch, fall or impact. Level 2: +2 to parry and dodge. Level 3: Kick attack does 1D8 points of damage. Level 4: +1 additional attack/action per melee round. Level 5: +1 to strike and disarm. Level 6: Critical Strike on an unmodified roll of 19 or 20. Level 7: +2 to damage. Level 8: Judo-style body flip/throw: does 1 D6 damage. and victim loses initiative and one attack. Level 9: +1 additional attack/action per melee round. Level 10: +2 to pull punch and +2 to roll with impact/punch/fall. Level 11: +1 to parry and dodge. Level 12: +1 to strike. Level 13: Critical Strike or knockout from behind. Level 14: +2 to damage. Level 15: + 1 additional attack/action per melee round. This is the fighting style taught to police officers, soldiers, bodyguards, thieves, and anybody else who will be expected to live by violence. While it lacks the artistry and flash of the Martial Arts, an Expert fighter knows how to scrap quickly and efficiently. At high levels, especially, those with this highly defensive combat skill set can often hold their own against dedicated masters of the martial arts. Note: Expert combat training enables the character to use any basic/common attacks, including Punch, Elbow, Kick, Knee, Disarm, Dodge, Lntangle. Body Block/Tackle, Body Flip/Throw, Roll with Impact, Power Punch, Power Kick, and Pull Punch and even some martial arts moves (as noted below) - but unless noted below, the character does not have special moves or martial art attacks such as Automatic Dodge, Back Flip, Holds, Karate Punches, Leap Kick or other moves. Level 1: Starts with four attacks/actions per melee, kick attack (1D8 damage), +2 to pull punch, and +2 to roll with punch, fall or impact. Level 2: +3 to parry and dodge, and +1 to pull punch. Level 3: +2 to strike, +2 to disarm, and can perform a Karate Punch (2D4 damage). Level 6: Critical Strike on an unmodified roll of 18, 19, or 20. Level 8: Body flip/throw; does 1D6 damage, and victim loses Initiative and one attack. Level 9: +1 additional attack/action per melee and +1 to disarm. Level 10: +3 to damage. Level 11: Knockout/stun on an unmodified roll of 18, 19, or 20. Level 12: +2 to parry and dodge. Level 13: Critical Strike or knockout from behind (triple damage). Level 14: +1 additional attack/action per melee round. Level 15: Death blow on a roll of Natural 20.
basic/common attacks, including Punch, Elbow, Kick, Knee, Disarm, Dodge, Entangle, Body Block/Tackle, Body Flip/Throw, Roll with Impact, Power Punch, Power Kick, and Pull Punch as well as the martial arts moves noted below. Level 1: Starts with four attacks/actions per melee; +3 to pull punch and +3 to roll with impact/punch/fall, and body flip/throw; does 1D6 damage, victim loses initiative and one attack. Level 2: +3 to parry and dodge; +2 to strike, and may perform Karate and any hand strike/punch. Level 3: +1 on initiative, and may perform a Karate-style kick (does 2D6 damage) and any foot strike except Leap Kick. Level 5: Leap Kick (308 damage, but counts as two melee attacks), and +2 to entangle. Level 6: Critical Strike on an unmodified roll of 18, 19 or 20. Level 7: W.P. Paired Weapons, can perform Holds and is +2 to disarm. Level 8: Back flip and back flip escape. Level 10: Back flip attack and +2 to disarm. Level 11: +4 to damage and +1 on initiative. Level 13: Knockout/stun on an unmodified roll of 18, 19 or 20. Level 15: Death blow on a roll ofa Natural 20.
not have special martial art moves. Level 1: Starts with three attacks/actions per melee round, +2 to strike, and W.P. Paired Weapons. Level 2: +1 on initiative and +2 additional attacks/actions per melee round. Level 3: Karate Punch (2D4 damage), +3 to pull punch, and +2 to roll with impact/punch/fall. Level 4: Karate Kick (2D6 damage), +4 to damage on all physical attacks, and +1 on initiative. Level 5: +1 additional attack/action per melee round and +1 to strike with a thrown weapon. Level 6: +3 to parry/dodge, +2 to entangle and backhand strike (1D6 damage). Level 7: Knockout/stun on an unmodified roll of 17-20 and leap kick (3D8 damage, but counts as two melee attacks). Level 8: +1 additional attack/action per melee round, +1 to strike with guns, and +1 on initiative. Level 9: +1 on initiative and can perform back flip. Level 10: Critical Strike on an unmodified roll of 19 or 20. Level 11: +2 to strike in hand to hand, + I to strike with a thrown weapon and with guns, and can perform back flip attack. Level 12: +2 to pull punch and Death blow on a roll of a Natural 19 or 20. Level 13: +1 additional attack/action per melee round. Level 14: +2 to damage and can perform Holds. Level 15: +2 to strike in hand to hand and +1 to strike with guns. This style of combat is a quick and dirty form of martial arts typically available only to the members of the military and intelligence agencies, and even then, only to special operations teams such as Commandos, Navy Seals, Special Forces and Military Specialists. Taking from Akido, Krav Maga, Sambo, Jujitsu, and other specialized combat styles, this generalized style is quite effective. does not have special martial art moves. Level 1: Starts with four attacks/actions per melee round, W.P. Paired Weapons, body flip/throw, body block/tackle and +2 to save vs Horror Factor. Level 3: +1 on initiative, +1 to disarm, and Karate punch/strike (does 2D4 damage). Level 4: +1 additional attack/action per melee and Karate kick (does 2D6). Level 5: +2 to automatic dodge and gain all foot strikes. Level 7: +2 to damage, +1 to save vs Horror Factor, +1 to disarm, +1 to automatic dodge, and +2 to pull punch. Level 8: +1 additional attack per melee, Jump kick, +2 to body flip/throw, and +1 to roll with punch/fall/impact. Level 9: Death blow on a Natural 18-20 and +2 to pull punch. Level 10: +2 to save vs Horror Factor, +1 on initiative and + 1 to strike. Level 11: +1 to disarm, +1 to pull punch, and + 2 to body flip/throw. Level 12: +2 to damage, +1 to parry and dodge, +2 to automatic dodge. Level 13: +1 additional attack/action per melee. Level 14: Can perform holds and is +1 on initiative. Level 15: Critical Strike on a Natural 17-20. If your class lists as having a flat 98% in Language (Native) or some such, your bonus for spoken is the HIGHER of the bonus you would get for learning another language or +10%. If your Literacy (Native Language) skill lists as having a flat 98%, your starting skill is the the higher of the highest Literacy or Technical bonus the character has or +48% (high enough that it will be 98% at level 3). To be clear, skills keep growing past 98%, but only count for offsetting penalties. A Roll of 99-00 is always a failure. It MAY be possible to take some Patreon Items as Nightbane Talents, with an appropriate PPE cost per use (but no PPE charge to get). NG Equalizer - This creates a 5d6 physical blast that does knockback. Each blast costs 11 PPE. GAW Throwback Essentially a rapid fire shotgun that can be used either on a single target or as a spray to target a group. Functionally it does 3d6 damage for a single blast costing 3 PPE that affects one person, a 6d6 blast for 5 PPE, or a 1d10+10 blast for 10 PPE, or does an area spray for 7 that does a 3d6 blast to an area doing 1d4 attacks (all characters attacked with the same strike roll), or against 1d8 characters for 15. T4-2044 Flexible Armored Suit - This generates a defense similar to a Shadow Shield, but one that has a lot of useful features, for a mere 20 PPE a round it grants an extra 45 SDC + 5 SDC per level, gives a Natural AR 14, and renders the user immune to energy attacks. This does not work vs cold, and magical energy attacks do half damage. Nano-Hive Brain Implant - This is similar to the Eavesdrop talent or the Piece Work talent. It creates a physical manifestation that can separate from the body, but one that flies around and that can actually be seen through, remote controlled, and can be used to lift and carry small items. For the duration (20 minutes) the Nightbane sacrifices 10 SDC and 4 HP, at a cost of 6 PPE they can send out a drone, which functions otherwise like described. The Nightbane can not recover the damage while the drone exists, but will automatically do so when the drone returns and will heal normally if the drone is destroyed. Empress Heavy Ion Pistol - This shuts down any electronic device struck for 1d6+1 minutes added to a fairly potent energy blast. 7 PPE per blast. ATEA-50 Supai Stealth Armor - This functions like the Flexible Armored Suit above, but with 100 starting SDC +10 per level, Natural AR 16, and instead of the immunity to energy, it grants immunity to detection by all machines and the ability of not needing to breathe for the duration, plus a stealth bonus. Cost 25 PPE per round. KLS Triarius Heavy Armor - yet another armor manifestation, this one having 300 +30 per level SCD, Natural AR 18, Sensory enhancers, does not breathe and a Shield that functions like a Mirror Shield. This costs 70 PPE to manifest, but lasts for 10 minutes per use. Shockwave TW Grenade Launcher - What this is is an explosion with an additional special effect, the grenade itself costs 4 ppe to create (created in groups of 4 for 16 PPE), then the 20 ppe for the extra special effect is added when the grenade is fired. The "grenade" can be held for up to 10 minutes without being used. Universal Energy to Matter Converter - This talent allows the Nightbane to repair damaged items or heal people, it costs 5 PPE per 10 SDC or 5 HP restored and the character must sacrifice the same amount (but heals normally after). KLS-RG-15X Manpack Electromagnetic Rail Gun This functions similar to the Necrosis Talent, except it can effect inorganic Nightbane (and objects) also and has a MUCH longer range...and it does not allow a saving throw (though it does require a strike roll). PPE cost 24 per attack. Altess Eviscerator - Not a Talent. NEMA Liberator Multi-Rifle Bought as a talent, it is essentially a basic blast effect with an extra special effect. 2 ppe per 1d6 SDC inflicted. House Rule on Breath Holding. As per PU3 in the suffocation effect of APS: Void, you can hold your breath 5 seconds per point of PE, if you have time to prepare. This assume NO Talking or Spell casting. The SCUBA skill can double the length of time you can hold your breath. Jack was required to make a save early because he spoke aloud 3 times. Alex and Franklin cast spells. Alex failed his save and went unconscious. In general, Sense Nightbane functions much like Presence Sense, you know the other being is there...but sensing the exact location it a bit more difficult. If a Nightbane is there, but under invisibility or shadow meld or any other physical concealment power, it acts exactly like presence sense. You get an idea how distant they are within range and that is it. The Shroud, being mental, blocks Sense Nightbane just as well as it blocks sight and hearing. Astral Travel, the person is considered invisible...which presumably means they will be able to use Sense Nightbane on anyone they can see (which, since being astral includes See Invisible, means anyone not physically concealed). Angel/Spirit of Light: Many cultures have tales of beings from the heavens that descend to help the innocent, defeat the wicked, and push back the darkness. In this case, the Nightbane's Morphus resembles what is commonly looked upon as an angel. Most Nightbane with this feature have a Good or Unprincipled alignment and are caring and helping, or someone who stands up against injustice. Angelic Nightbane are 7-8 feet tall, and weigh between 200-300 pounds (always lighter than they would seem based on height). Nightbane with this Morphus trait glow with an inner light, and many have semi-transparent rings of light or an aura around their head. 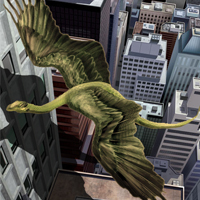 All have a pair of wings, with a wingspan of of two to three times their height. Their wings can have a variety of appearances, but most are feathered wings, with a large variety in colors, including metallic colors. Some even have wings made of brilliant energy. Bonuses: +2 M.E., +1d4 M.A., +2 P.E., +1 P.S., +1d6 P.B., +2d6 hit points, 1d4x10 S.D.C., +2 Awe/Horror Factor, wings that allow a flying speed of 1d6x10+40. Each wing has 1d6x10+50 S.D.C., regenerates at the same rate as the Nightbane, if destroyed if completely grows back in 24 hours, and allows the Nightbane to hover if desired or needed. They can also glide silently. +5d6 P.P.E., +1 Initiative, +2 to Pull Punch, +2 to dodge when flying only. Exceptional vision (can see a rabbit or read a sign a mile/1.6 km away) gives them a +2 bonus to Perception rolls based on sight. For purposes of picking talents, this Morphus trait also counts as being an Angelic, Fantasy, and Superbeing Morphus trait. Penalties: In Morphus form the Nightbane cannot use Prowl or Disguise, and Undercover Ops is impossible. And other than Detect Ambush, Detect Concealment, Intelligence, and Interrogation, they suffer a -30% to Espionage or Rogue skills. Any creature with the ability to sense supernatural beings can sense the Nightbane at twice their usual range. They generally do not like being in cramped spaces, and due to their size, they need a large vehicle like a minivan, a truck or something of similar size and space to use vehicular transportation. They attract more attention from all types of supernatural evil, and are usually targeted first for elimination. Most Angelic Nightbane have a strong desire to protect the innocent and oppressed, even at great personal cost.